If you are bothered by stretch marks, you’re not alone. Over 75% of all women get stretch marks at some point in their lives. Stretch marks are pink, red, or white in color. They appear to be slightly depressed lines on your skin. They often reside on the hips, abdomen, breasts, and buttocks. Many stretch marks will fade away with time, but some are permanent and look like deep scars. Stretch marks are caused by rapid stretching of the skin during periods of growth. The normal expansion of the skin cannot keep pace with growth and a tear happens in the dermis. This will often occur during puberty, pregnancy, or significant weight gain. A color change occurs as well, with pink or red hues appearing when stretch marks are young (the first year) and newly formed. V-Beam is one of the latest advances in the area of gentle, non-wounding light treatment of the skin and stretch marks. It is a state-of-the-art advancement of a technology that has been tested and used safely on patients for many years to treat a variety of skin conditions, including stretch marks. During treatment, the laser delivers an intense but gentle burst of yellow light to the skin. The light is specifically absorbed by the blood vessels in the dermis. These blood vessels are coagulated and then reabsorbed by the body during the natural healing process. Fraxel laser treatment improves your appearance by applying columns of laser energy, affecting only a fraction of your skin at a time with thousands of microscopic laser spots. 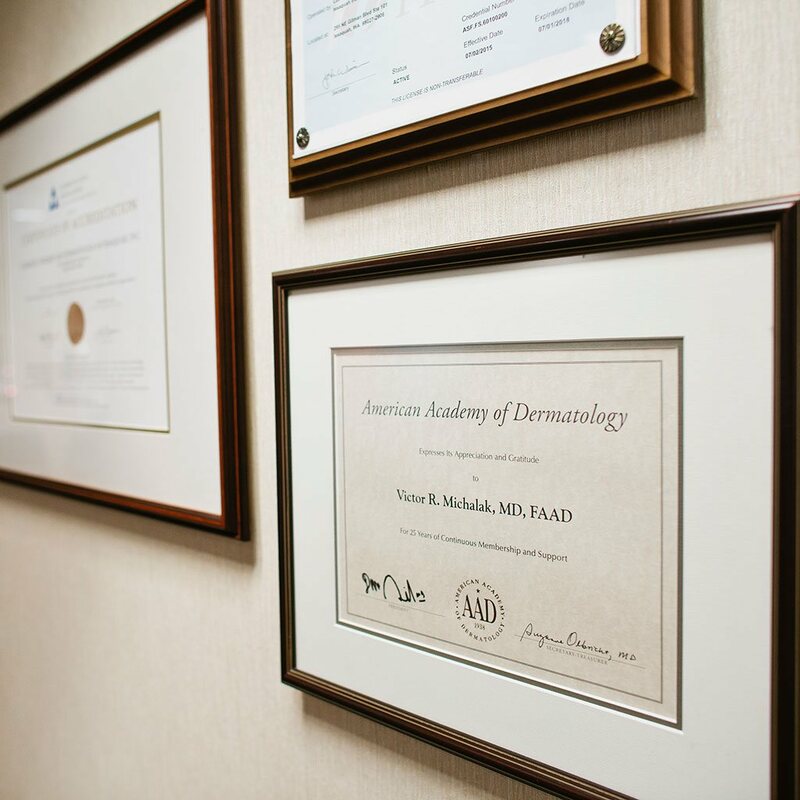 During your Fraxel treatment, Cosmetic Surgeon & Dermatologist Dr. Michalak makes several passes across the skin, applying the laser energy in an even pattern. Fraxel can be applied to the face, neck, chest, and extremities. Normally 3-4 treatments are recommended at 2-3 week intervals for optimal results. A noticeable difference in skin texture is noted with each treatment. Please Dial 425-391-2500 extension 7 for Carolyn, our cosmetic patient coordinator, for more detailed information or to schedule a Fraxel laser treatment with Dr. Michalak.